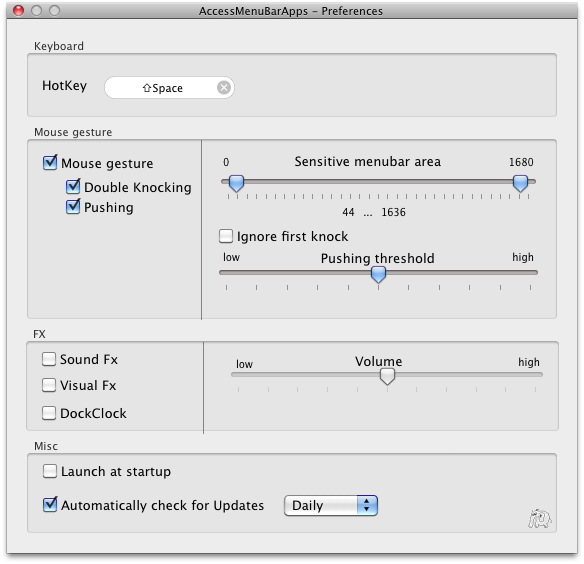 AccessMenuBarApps is a simple application that minimizes the items in the menu bar to allow access to all the icons of software present in this one. If you are fond of small and useful practical applications, you may have noticed an increasing number of apps just put their little icon in the menu bar of Mac OS X. If this provides quick access quite interesting, but with the proliferation of applications installed, this portion of the Finder quickly becomes cluttered..And for those who has a small screen, some icons are sometimes marked with the menus of the application first. AccessMenuBarApps every living thing has a solution to this problem, but ultimately quite convenient. Indeed, the application menu of the app is minimized, so that when we call it in the foreground, the menu bar is full of space, and therefore shows the icons may be hidden. 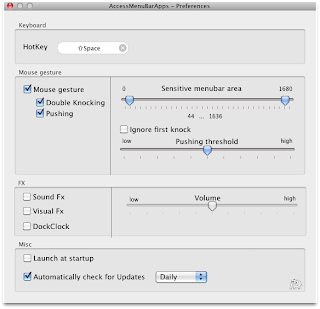 History of making its use a little more practice, the application can be called from a simple keyboard shortcut, Shift + Space by default, configured from the preferences of the software. At this same place, it is also possible to activate / deactivate the sound played for each call AccessMenuBarApps (recommended to avoid going crazy) or enable / disable the option to call the software to the forefront in "tapping" twice the cursor against the top of the screen.